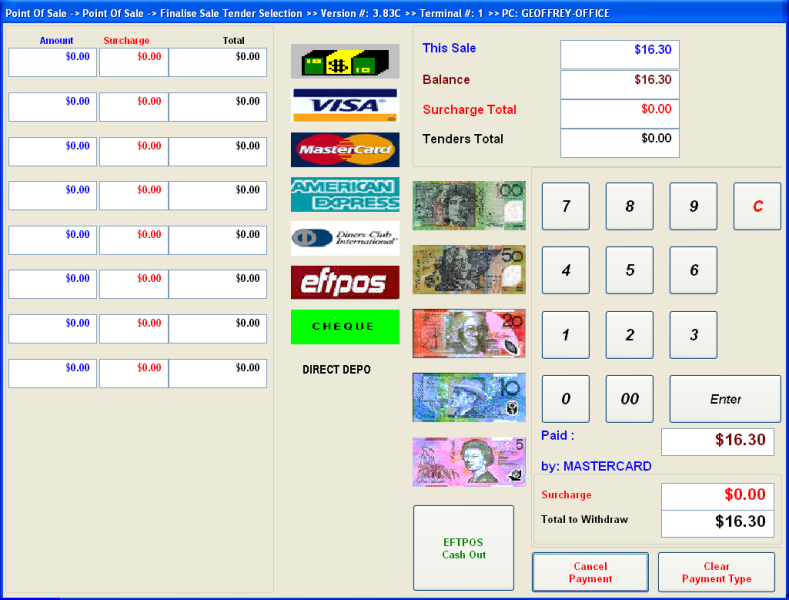 The Newsagency POS Software allows EFTPOS Integration to all major Australian Banks and Tyro EFTPOS. By linking your Newsagency POS Terminal to an Ingenico or Tyro EFTPOS Terminal, the transaction total is automatically sent into the EFTPOS Terminal avoiding the need to re-key the transaction total. This not only saves valuable time but also ensures transaction accuracy and enhances store security. Debit Card "Cash Out" is also supported. You will need to order your Ingenico EFTPOS Terminal from your bank or Tyro EFTPOS terminals direct from Tyro. They will come with all necessary cables that are required to link to Newsagency POS Software. You will require either a spare serial or USB port on your POS Computer / Terminal or if you are using Tyro it will connect directly into your network switch. 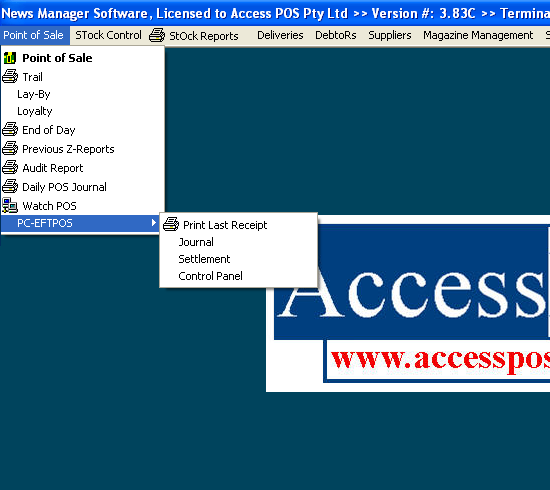 Access POS can then assist you with the installation of the Newsagency EFTPOS Software that will enable communication between your POS Computer / Terminal and EFTPOS unit. You can not purchase the EFTPOS Link Software Add-on as "stand-alone" ie. 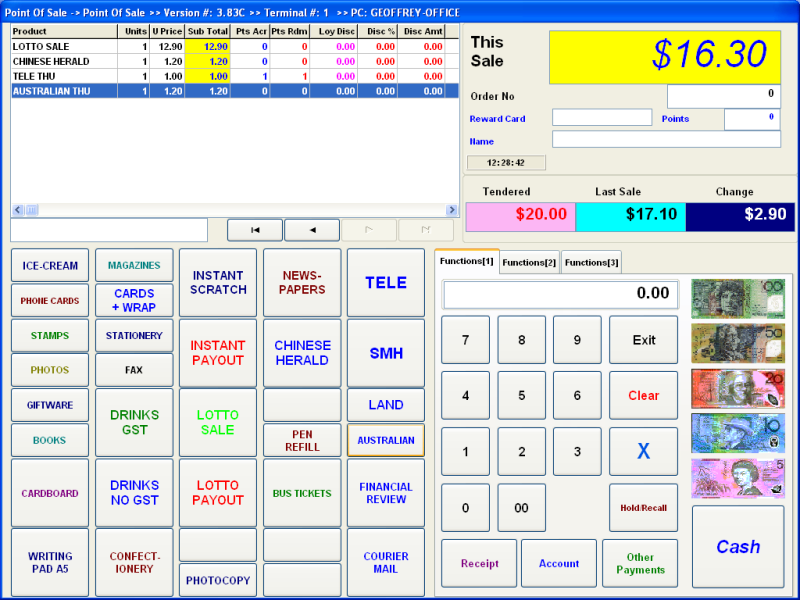 You must already have purchased the core Newsagency POS Software license or you can purchase the EFTPOS Link Software Add-on at the same time as the core Newsagency POS Software product. You need to purchase the same number of EFTPOS Link Software licenses as the number of computers you are licensed for the Retail Manager POS Software. ie. if you are licensed for four (4) computers then you would need to purchase four (4) EFTPOS Link Software licenses. Ford Performance Racing implemented a completely new merchandising distribution system involving a new POS System fully integrated into their online store. An email gratefully received from the Ford Performance Racing - CEO. Just a message of thanks to everyone's contribution all the way from the Design, approvals & production of the Merchandise program, to the ideas & engineering of the membership program, to all the Logistics of all the approvals, software writing & planning, ideas of design & lay outs, construction of how the shopping cart looks & needs to work ect ect etc the list goes on. It is a great achievement by all at this point to pull our program in house & for all of us to have a form of Ownership to this success, driven by a lot of Passionate ideas & suppliers with a real interest to help us succeed.